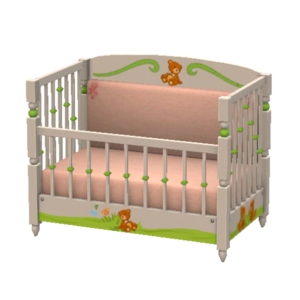 Let your toddlers rest in comfort in the surrounds of this safe and secure Wilderness Crib. Its reinforced frame and heavy wood structure makes the Wilderness Crib last for generations and generations. You will never have an excuse to buy another one once you have this one. 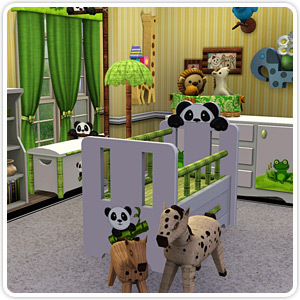 Unleash the whimsy of the wild with this complete set of bedroom furniture where animals and imaginations run amok. Lions, and Monkeys, and Polar Bears, Oh My! Have your little ones dream of the wild as lions strut across the savannah and polar bears float on ice. 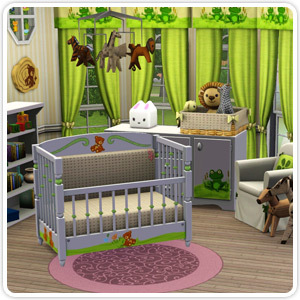 Kids need cool digs too! 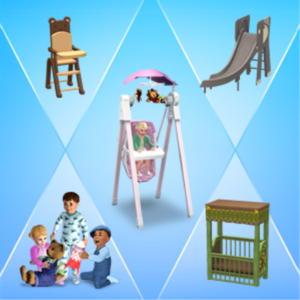 Have you ever wanted to own every kids themed item from The Sims 3 Store? Now you can with the Kids! 2010 Compilation!